Four: Others know to stay away from you when you’re reading a book. Especially if they can see you’re in the last few chapters. It could be hazardous to their health to interrupt. Five: You’ve managed to convince yourself that books scattered around your home are really a sophisticated and simple form of interior decorating. Six: You follow this blog (which you should . . . just click on the little button on the left to get a weekly email when there’s a new post! ), as well as the blogs and Facebook pages of all of your favorite authors. This means you know the names of their kids and their dog, their favorite kind of coffee, and the exact day, hour, and minute when their next book will be available. And you’ll be there. Waiting. Seven: Your library card is faded from frequent use, and the librarians all know you by name. You’ve heard rumors that they’re considering naming a wing of the library after you, since you are their most frequent visitor. Eight: Sometimes your daydreams look like a book trailer from a romantic suspense novel. Because, really, who would want a normal, boring life when they could be investigating murders and running from criminals? Nine: If your neighbors hear a piercing shriek, they won’t assume you’re being murdered or call the police. They’ll just figure you got a package from Amazon with a new release inside. Eleven: Your outrage when someone gives away the ending of a book can only be matched by your horror when someone disfigures one or tears out a page. And don’t even bring up the subject of book burnings. . . .
Twelve: Your list of qualities to look for in a spouse was/is suspiciously similar to the traits of the romantic lead in your favorite novel. 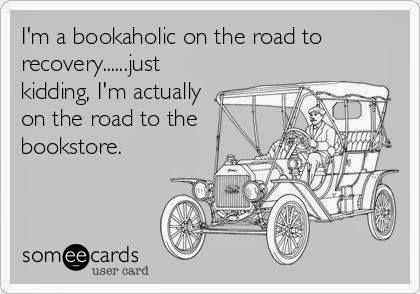 How would you finish the phrase “You know you’re a bookaholic when . . .”? Probably all of them. I did choose the name Trent for my youngest son. It was from an Emilie Loring book I read long ago, although I believe it was a surname not a first name. That’s great, Violetta! I’ve always said that if it wasn’t such a strange name, I’d probably name my first son Atticus from To Kill a Mockingbird. You know you’re a bookaholic when you have read the same book several times and can tell each discrepancy between the book and movie based on the book. Yes, Tracy! I love comparing reactions to movies of people who read the book and people who didn’t. They’re often two very different things! Yep, even guilty of #3, the oldest boy is named after the hero in the first Christian fiction novel I ever read…..didn’t tell hubby where I got the name until after he liked it. 🙂 The second son was sooooooo close to being named after the first hero I wrote. Your house has many piles of books AND you have a full Kindle! That’s great, Vivian! I’m sure most of our houses would be even more crowded with books if we didn’t have ereaders! I’m so guilty on a number of these since 7th grade (over 55 years ago) ; but not all! LOL. I stay up as late as I dare reading and then wishing I could still read longer. Faith, I completely agree. I remember reading with a flashlight under the covers after bedtime! Maybe you know you’re a bookaholic when you need a custom built bookcase made out of 1″ solid hardwood, instead of buying one of those light weight units in the store. Yes, Anne! It’s so true. I bought all of my bookshelves at an antique shop. They don’t make ’em like they used to. You might know you’re a bookaholic when almost every closet and dresser contains books (these are in addition to the bookshelves in every room, of course). Even more, when one of your closets has more books that clothes! Love this, Christy! Thanks, Rissi! Not going to lie, I kind of just looked at my own life and exaggerated a little. But only a little. I love what this post says about telling people to “go away.” When I’m REALLY into a book, if someone tries to talk to me, basically I don’t “hear” them, it’s kind of my way of saying… I HAVE TO KEEP READING. NO TIME FOR CONVERSATION. And, yes, I adore Lucy too. As a result, I’ve developed more of a fondness for that name because of that character. She’s precious. You name your farm and business after a fictional place in some of your favorite books…Valley Oaks Farm, LLC. Jackie, I was just talking to a coworker about how more of us should name our homes after fictional places, but a business works just as well. Love it! You know you’re a bookaholic when your parents have to ground you from reading, just so your chores would get done. This was a common occurrence in my house when I was growing up. Being sent to my room had little to no effect on me until my mom started taking away my books too. My nieces and nephew all laugh at that little tidbit from my childhood. My mom would ground me from reading too. I thought I was the only one. Number 10 is definitely me! …when you carry a book with you EVERYWHERE you go! Yep!! Totally agree with this one! #13: You spend all your money on books, when really you should be getting your car repaired. Who needs brakes, right? #13 You become a Librarian just to be around more books and topay for the ones you just have to own! Most of the signs suit me to a T! You want to be reincarnated as a librarian, as there’s no way possible to read all the books you’d like in this lifetime. #1 & #4 hit home, except I even have a harder time keeping the fictional characters I’m writing about out of normal conversation. My husband feels like the characters move in with our family while I’m writing. 🙂 And no one bothers me when I’m at the end of a book! You might be a bookaholic when friends and family members use your book collection like a public library–and they never run out of books to borrow. I absolutely love this and have to say I am a proud Bookaholic. All of these especially #3. My middle son is named after Landon Carter from A Walk to Remember. Also one of my favorite authors named a character in her book Landyn, she liked my son’s name so much, and the way I spelled it. Proud Bookaholic here. LOVED this post! I’m guilty of all of them. But 2, 3, 7 and 9 really hit home. Book lover and proud of it 😀 Thanks for the fun post! You know you’re a bookaholic when you stay in the bathtub reading a book until your water is cold or your book gets wet! You know you’re a bookaholic when . .reading a good book by Colleen Colbert or Beverly Lewis, I don’t stop for meals or dishes until I’m at a good stopping point. Keep up the good work inspirational authors!!!!!! You nailed it…Me to a tee….The mail man throws my packages and runs I get so excited when I get a new book in the mail….